Jack Blank And the Imagine Nation – The Accidental Hero – A Jack Blank Adventure: Call it what you want, it’s an awesome book! 12-year-old Jack Blank doesn’t know who he is, where he came from or who his parents are. He does know that he’s a VERY bored orphan at St. Barnaby’s Home for the Hopeless, Abandoned, Forgotten, and Lost (a pretty depressing place). Finally something exciting (but pretty frightening) happens in Jack’s life: He gets attacked by an evil Robo-Zombie and has to find a way to destroy it! Jack is saved from the orphanage by Jazen Knight, an official from the Imagine Nation. Jazen takes Jack to the Imagine Nation. The Imagine Nation is a secret place where every superhero and evil villain you can imagine come from. In the Imagine Nation, Jack makes new friends (and enemies), discovers who he really is and finds out it is up to him to save the world! I first have to tell you that, for me, any book that has ninjas AND robot zombies would be pretty hard not to like! I was thinking the story was going to be similar to other series out there, but it is really exciting and different. I like the story plot in the book because it is about all the ideas in comic books being real in the Imagine Nation. Jack is a great character that you want to know more about. At the end of the book I wanted it to keep going. I want to know what happens to the characters. GOOD NEWS! The second book in the Jack Blank Adventure series, The Secret War, comes out on August 9, 2011!! I’ve pre-ordered my copy already! The book I read was called Jack Blank and The Imagine Nation (2010) and I was talking to my cousin about it and he told me about a book he liked called The Accidental Hero (2011) and we figured out it is the same awesome book. 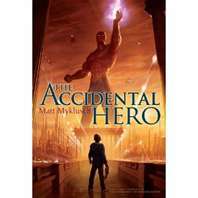 So the book has been republished as The Accidental Hero and the series is called Jack Blank Adventures and if you want to know more go to www.jackblank.com ! I give both books 5 out of 5 book worms! Kindle editions are available in title links. Preorder The Secret War. Erik is a pretty amazing 9-year-old with his own book review blog. Check it out. He’s got lots of intelligent, helpful insights from a kid’s perspective. Erik is going into the fourth grade. don’t you think, this novel is so Harry Potterish ..?